In two videos, seasonal phenomena are observed and recorded by means of over 80 named varieties of ice, snow, and winter weather in the Newfoundland dialect. These terms are precise, practical, evocative, sonic, and lyrical. Knowing them helps us actually see different phenomena, instead of winter being just a cold, white blur. Some examples are: ballicattered (covered with a layer of ice from the action of spray or waves), devil’s blanket (a snowfall that hinders your usual work), sish (fine, granulated ice floating on the surface of the sea), and way ice (loose ice that is easy to navigate). One of the videos is a 26-minute-long documentary video-poem based on the Blast Hole Pond River that flows through the patch of boreal forest where the artist lives in Newfoundland; the other video is a real-time, single take of sea ice in Conception Bay shot from the Bell Island ferry in March 2014 when it was so cold that the bay itself froze for the first time in decades. It’s not uncommon for Arctic ice or drift-ice (floating masses or fragments of ice driven by wind and current) to float into the bay, but this was local ice, or bay ice. The word “treasury” usually describes a collection of highly valued poems; it is used in the exhibition’s title to describe a collection of highly valued poetic terms. There is a wide local vocabulary to distinguish specific phenomena in the continuous modulations of winter weather. But this vocabulary is now a fragile intangible artifact. The loss of local linguistic complexity is a result of major changes in Newfoundland & Labrador, particularly the decline of the fishery as an occupation. And these terms are fragile for another reason—climate change. The exhibition will include the video-poem From the Ground Tier to a Sparrow Batch: A Newfoundland Treasury of Terms for Ice and Snow, Blast Hole Pond River, Winter 2012-2013. 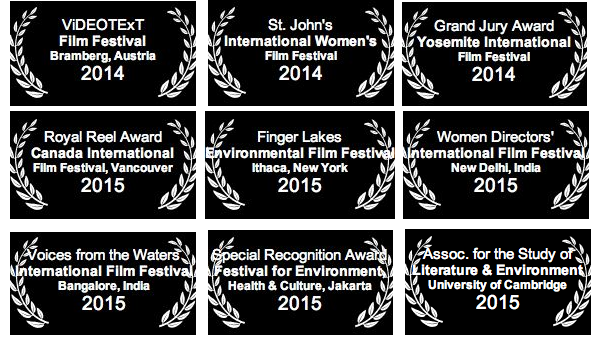 It has been screened in Austria, Canada, India, the UK, and the USA, and has won several awards, including the Grand Jury Award at the 2014 Yosemite International Film Festival. Marlene Creates’s theoretical and studio research interests include photography, ecology, and poetry. Underlying all her work, spanning over 35 years, is an interest in place — not as a geographical location but as a process that involves memory, multiple narratives, ecology, language, and both scientific and vernacular knowledge. Since 2002 her principal artistic venture has been to closely observe and work with one particular place — the six acres of boreal forest that she inhabits in Newfoundland, Canada. Since the 1970s her work has been presented in over 300 exhibitions across Canada and in Ireland, Scotland, England, France, Denmark, the USA, and China. Her work is in numerous public collections, including the National Gallery of Canada. She has been a guest lecturer at over 150 institutions and conferences, both in Canada and abroad. She is currently an invited academic visitor for the “Art, Space + Nature” Masters programme at the Edinburgh College of Art. With the assistance of The Canada Council for the Arts and ArtsNL. This entry was posted on October 27, 2015 at 8:30 am and is filed under Artists, Exhibitions, Knowledge, Methodologies, Sited work. You can follow any responses to this entry through the RSS 2.0 feed. You can leave a response, or trackback from your own site.